North Adelaide is dying, and seems determined to slip away quietly – a ghost of its former glory. Tom Richardson asks what can be done to save the city’s northern fringe from seeing out its existence as an extravagant gateway to the suburbs. When we think of south Adelaide, east Adelaide or west Adelaide, we think of them as various corners of the city, each with their own cultural idiosyncrasies. But not so North Adelaide. That has never been a part of the city. It is its own suburb, with its own postcode. A postcode once considered among the more desirable to have printed on your letterhead. North Adelaide is dying, if not already dead. North Adelaide has long retained a distant, lofty air – both in physical geography and character. It is physically divided from the city with which it shares a name by a river and a hill, helping to entrench the sense of it as a kingdom overlooking its proletariat subjects. It is not a destination. And it has no industrial, professional or even cultural hub to sustain it. That sense has long been cherished by some of those behind the River Torrens moat, and diligently protected with the aid of influential voices in local government and a stern adherence to the letter and spirit of the Heritage Act. But this isn’t about perpetuating the confected bourgeois stereotypes of the residents as disdainful elites averse to the onset of progress. Indeed, through an on-again, off-again relationship over many years, I have great affection for North Adelaide. I lived on the outskirts of the suburb for a time as a kid, and spent almost a decade working on Tynte St at Channel 9. As such, I’ve always pondered the prestige with which it is held (and evidently holds itself). For instance, it lies directly under a flight path, which means every phone conversation is routinely suspended by the passing roar of an overhead airbus. Nonetheless, I’m sure it would be a pretty damn good place to live. But it’s a pretty damn lousy place to visit. On rare occasions, if I’m passing, I’ll stop into one of the old cafes that I used to frequent, for old time’s sake – those, at least, that are still there. And there I’ll sit, and muse at the dispiriting absence of customers. And then I’ll wander back to my car – you generally need a car to pop into North Adelaide on a whim – past the ubiquitous fencing surrounding the old Le Cornu site and the increasingly prevalent vacant shopfronts, half expecting to trip over a passing tumbleweed mid-stride. I used to eat, drink and shop here because I worked here, and there are some nice bars, pubs and restaurants. But in truth, you wouldn’t frequent them if they weren’t convenient. And North Adelaide has become basically an attractive inconvenience. An extravagant gateway to the northern suburbs. A year after I left Channel 9, Channel 9 left North Adelaide. Channel Ten had already pulled up stumps a few years earlier. There is the odd boutique office about the place, but the rest of the O’Connell St strip is basically one big service centre, servicing a fast diminishing clientele. Politicians at times bemoan our unemployment woes by warning we stand to become a state of people serving each other increasingly expensive café lattes; North Adelaide exemplifies that conundrum. Even the long-promised and wistfully-imagined grand dreams for the Le Cornu site, I fear, will not reinject the much-needed life that has seeped from the O’Connell Street artery. North Adelaide’s great asset has become its curse. It is too lofty, too distant. Its salvation, I believe, will come from ending the tyranny of distance. North Adelaide should become, culturally and physically, the northern extension of the city. And it can do this by re-extending the tramline down King William Rd and up the hill to O’Connell St.
City revellers of an evening would think little of traversing Rundle Mall to bar-hop from the east to west end of the CBD, but few ever countenance popping into North Adelaide for a change of scene. It’s, quite literally, a bridge too far. But if it became a mere matter of a few minutes on a free tram, that equation could change. Moreover, the city footprint would effectively double. The much-hyped and justly-ridiculed watchword of this State Government – vibrancy – would finally filter through the doldrums to the north. 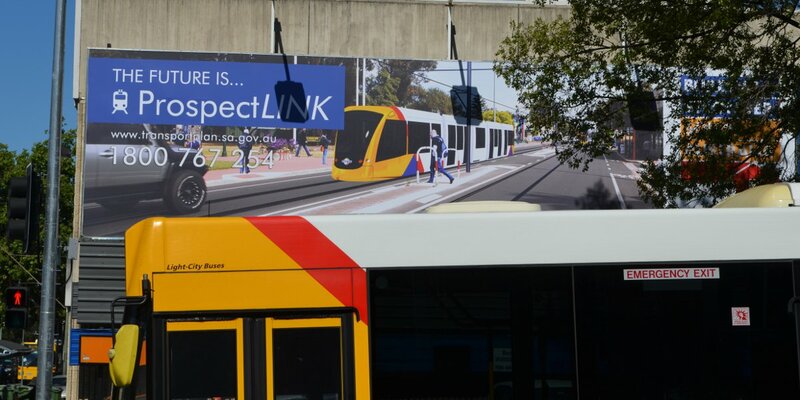 A Government billboard promising a tram through North Adelaide before the 2014 state election. True enough, there is currently a free city council shuttle bus that loops through North Adelaide. I’m sure it’s quite useful to those who are aware of it. But there used to a beeline bus service that traversed the same route now serviced by the city tramline – and that didn’t stop the number of patrons increasing exponentially once the tram extension was built. It’s oft-stated that light rail is a game-changer for the area in which it’s built… and for North Adelaide, the game desperately needs changing. Whether the State Government is minded to stump up the cash to do that, given the area is home to councillors and residents that have long thwarted its various grand designs, is another question. There is already a notion ensconced in the state’s 30-year transport plan to extend the tramline through Prospect, where the local council has been eagerly lobbying to expedite the building work. But for now that work remains uncosted, unfunded, unpromised and undelivered. There’s no doubt Prospect would – or will – be enhanced by a light rail extension, as would any other area pushing to be prioritised. But, right now, North Adelaide doesn’t need enhancing. And by saving it, we could ultimately change the way we experience the city of Adelaide.